Have you ever picked up a book and skipped to the last page? This happened recently with one of my clients who wanted to learn how to make peace with food. On my recommendation, she purchased the book, Intuitive Eating by Tribole and Resch. 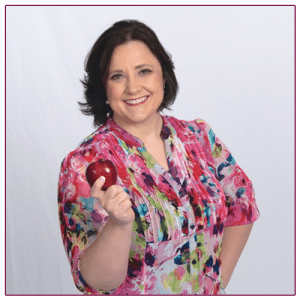 Instead of reading chapter one, which talks about ditching diets and why diets don’t work, she skipped to the last chapter of the book – Gentle Nutrition! While this might not seem like a big deal, it skipped the entire process of “unlearning” what diets had done to her. It skipped learning about how her yo-yo dieting for decades had influenced her body’s metabolism and influenced her physical and mental health in a negative way. It skipped how she had learned to view her body as a problem to be fixed and how she saw foods as only good or bad, not nourishing or satisfying. What in the World is a Healthy Relationship with Food? When you are ready to fully respect your body, you will be ready for the last principle of intuitive eating–honoring your health with gentle nutrition. A healthy relationship with food feels good, physically and emotionally. It means you eat a wide variety of foods in a balanced way, can eat flexibly in any situation and don’t view food as either good or bad. Food is neutral – it is fuel and it is also pleasurable. When a person is ready to embrace the gentle nutrition principle, you have (hopefully) made peace with all foods. This means that an apple or chicken breast is morally equivalent to a piece of cake or potato chip. Note that morality is very different from nutritional quality. It is important to allow space in your diet for balanced, nutritious foods from all the food groups, as well as “fun foods.” Fun foods taste good but have lower nutritional content. This means that a healthy diet does not make a person feel deprived or go back to any type of restrained eating. Ironically, the more deprivation that a person has experienced, the more likely they are to need fun foods in their diet on a regular basis. So how do we know what a “normal” and “healthy” diet looks like in the context of intuitive eating? The old tenets of food wisdom: balance, variety, moderation and satisfaction really do work. If you are reading this and start to feel nervous, deprived or anxious, you may not be ready for gentle nutrition. It could be a sign that you need to practice some of the earlier skills and principles of intuitive eating. You can always come back to nutrition when you feel ready! I like to think about our plate when designing meals and snacks for optimal nutritional health. A balanced plate has some type of protein food — this can be meat or vegetarian protein; has some type of carbohydrate such as grains or starchy vegetables; and fruits/vegetables. A balanced meal may also contain some type of calcium-containing product like milk or milk substitute, yogurt or cheese, and some fats for added satiety and satisfaction. This plate represents a general idea of the proportion of the various foods that comprise a “healthy and balanced” diet. The plate reminds us that eating involves mindfulness, compassion, is part of self-care, provides us with pleasure, and is a social activity. It shows us that the balanced plate contains a variety of foods from all food groups, as well as fluids and fun foods. At this point in gentle nutrition, you will find that you don’t want to eat a food because you feel you “should”, nor will you eat a food if you don’t like how it tastes! Consider taste when you consider nutrition and nutrition when you consider taste. Remember, you are feeding and respecting your body. This is called “body-food choice congruence” — a form of interoceptive awareness. Your internal awareness of how a certain food or meal makes you feel helps you decide what to eat beyond what your mind or tongue might crave. It is the merging of your nutrition knowledge with the new knowledge of your body. Are there nutritional “guidelines” that I am supposed to follow? At this point in your intuitive eating journey, you can look a bit more closely at the nutritional values of the foods you consume. You –and only you – can decide which “guidelines” feel right for your individual state of physical and mental health. 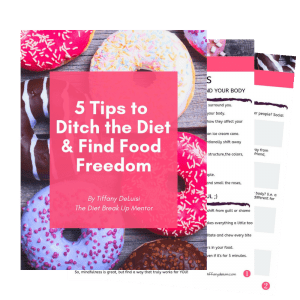 According to the most recent edition of the United States Dietary Guidelines, there are food and “lifestyle” recommendations that do contain some wisdom. This latest edition talks about the importance of flexible eating and different meal patterning. It also talks about moving your body for pleasure – which is in alignment with the values of intuitive eating and intuitive living. The following “recommendations” are taken directly from the *2015-2020 Dietary Guidelines for Americans, and I am only including those that feel truly aligned with Intuitive Eating. 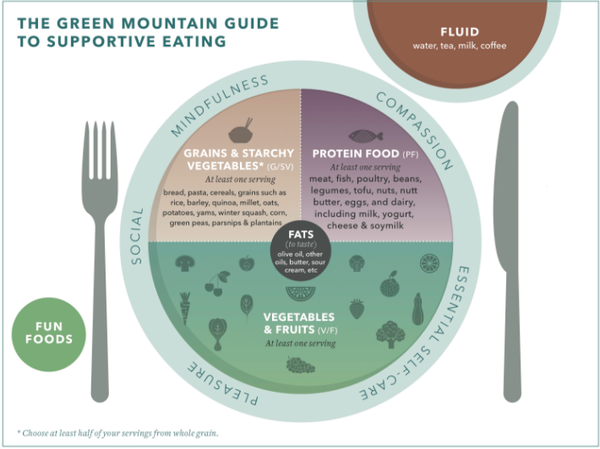 Follow a balanced eating pattern across the lifespan: This is talking about the importance of balance in our diet, including fruits and vegetables, grains, proteins, fats and dairy. Focus on variety, nutrient-dense foods, and amount: This is referring to the nutritional quality of our foods, so we get the maximum nutrient “bang for our buck.” At this point in intuitive eating, we are aware and comfortable with making food choices that honor our health and provide the variety of vitamins, minerals and other macronutrients our body needs to stay healthy. 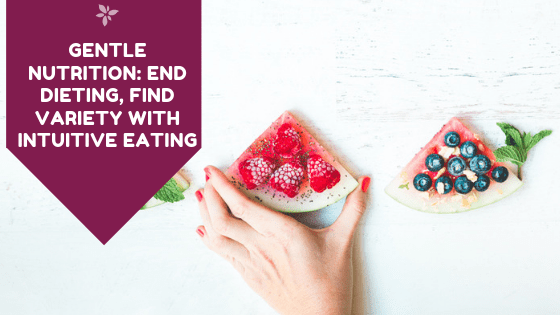 Remember that, in intuitive eating, we do not specify amounts or portion sizes – rather, your mindful awareness of internal cues of hunger and fullness drive eating experiences. Shift to more satisfying food and beverage choices: We are all aware of the contradictory headlines which promote one specific “superfood” one day and pan it the next. The Food Police are alive and well in the media! If you are always worried about what’s in your food, how can you possibly enjoy it? However, nutritionally, you can start to make decisions about if it makes nutritional sense to choose whole fruit if you need more fiber in your diet over juice or choosing water as a cooling beverage over sugary soda. There is nothing wrong with making informed choices between foods. For example, I prefer the taste of fat free milk over whole milk, since I grew up drinking it. This choice has nothing to do with the nutritional content of the food, but on the taste. When choosing a yummy dessert or satisfying meal, work to taste and savor every bite! Food is one of life’s pleasures, not just “medicine” for a healthy life. Let the way your body feels help you make informed choices. You don’t need to be a closet eater or food paragon of virtue. You don’t have to be perfect to value good health and fitness! Becoming an intuitive eater requires a conscious decision and commitment. It means developing a new way of viewing life. This can be quite difficult but can reward you with big payoffs that will affect the rest of your life. 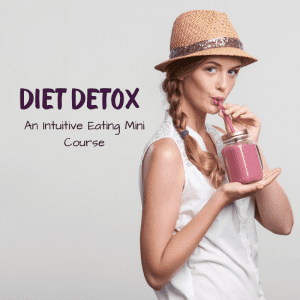 If you would like even more support you can learn on your own, my Diet Detox Program offers you all sorts of added training videos and lessons to give you even more support for your journey from disordered eating to intuitive eating. Don’t get trapped in the diet culture world. You can start to feel freer around food and appreciate your body for all that it does, regardless of its size or shape. Learn about health at every size and start today. You CAN change your life! PS. If you aren’t sure what is the best way for you to get support with your nutrition, feel free to book a no obligation call with me to determine your next best steps.